We really enjoyed our six years in Boulder, CO and made many friends there, so when moving day finally came, it was emotionally charged. Even on the day we were to set off on our road journey all our lovely neighbors kept stopping us to stay goodbye for the third and fourth time. As we drove away with a sad heart, and absorbing all the beauty of Boulder County, wondering if we can indeed return here to live some day, we just had to get on with our journey. We had done this CO to CA drive three times now, two east and one west, and each of those times we choose the “northern route” via Salt Lake City, Utah. We learned the day before that our household belongings would not arrive on this weekend, but actually a week later, so we could actually try the “southern route” which would add another day unless we drove a lot more than 300 miles per day. So our destination was getting near Fish Lake, Utah on the first day. We made good time and took a chance to find accommodation in small Hanksville, Utah after passing a larger town Green Rivers, Utah. Pando, Latin, for “I Spread” is a single colony of quaking aspen trees located near Fish Lake, Utah. When we approached it felt as if we did not leave Colorado, and geologically speaking, we had been still on the Colorado Plateau. Seeing the hills dotted with aspen trees was just lovely. At this time of year they were a nice dark green. I can only imagine the colors of orange and yellow in the autumn and perhaps those quiet roads of north Utah would be packed with seasonal color hunters, like what happens to the Peak to Peak Highway in Colorado. Pando is claimed to be the single largest oldest organism with identical genetics on earth. Whether it is as old as 80,000 years or at least since the last ice age 10,000 years ago, which wiped out a lot of many species, Pando was a delightful site to find. Getting there involved a wonderful drive through picturesque Capitol Reef National Park. We stopped a bit to admire wonderful petroglyphs (stone carved images) from the Puebloan ancestors. 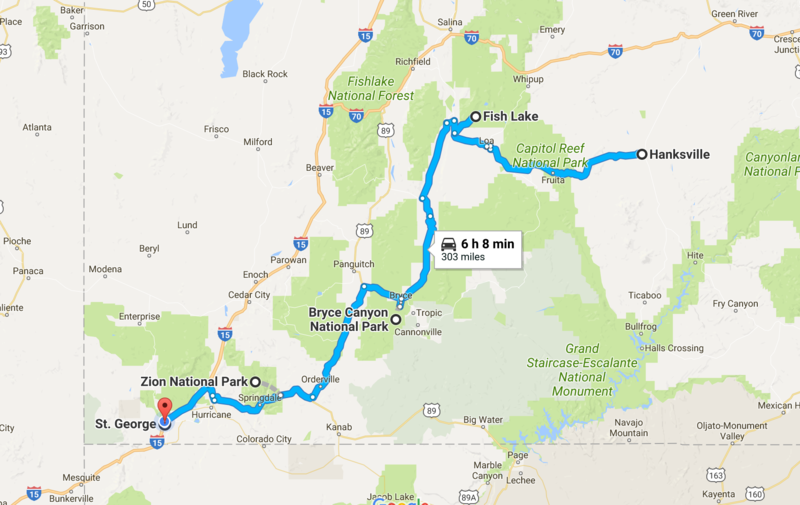 After Fish Lake, we looked at our progress and saw we had enough time to do a quick trip to see Bryce Canyon National Park. Robert had never been. I had visited it once back in 1998, which when I recalled that, I was humbled to realize that was nearly 20 years ago. Now with the height of the summer season and shuttle busses (which had not been part of the landscape 20 years ago), we did not know whether we could drive in at our own pace. We found we could and only manages less than 2 hours to see this natural beauty. Perhaps our shortest ever trip to a National Park. In any event, we knew we need to come back properly to do some of the lovely trails, perhaps best in winter where we can snowshoe the rim! Our evening destination was St George near the southernmost tip of Utah, and we got a lovely ride through Zion National Park, although with daylight fading, we did not have enough time to take the shuttle to see the majority of the park, leaving that for another visit. One highlight for me was driving through the narrow 1.1 mile Zion-Mount Carmel Tunnel, an impressive work of 1920 engineering. Of course the breathtaking scenery of the narrow roads winding through the canyon was amazing. I was driving so I only have the images in my mind. We started our journey in Utah, then a bit into Arizona, followed by a Las Vega fly-by in Nevada, across the desolate Nevada high dessert (with army vehicles for colorful attention and what would appear to be abandoned air force bases and we learned later, nuclear test sites), and ended in Mammoth Lakes, California, 8000 feet, near the beautiful Yosemite National Park. Beatty (pronounced BAY-dee), Utah was a quaint little town that broke our long journey north through Nevada after turning at Las Vegas. At 70 mph, it was less than a 2 hour drive from Nevada. We stopped at Mel’s Diner which was adorned with photos from the 1920s and 1940s illustrating its place in breaking the journey for passengers of old going to and from Las Vegas. Yet perhaps back then such a journey would have taken 5 or more hours and a restful break was indeed much warranted. Returning to our townhouse we moved away from over six years ago was the objective of the day. We had the choice of going over Tioga Pass and through Yosemite National Park, which we had done previously, or a different route, which according to Google, although more in mileage would actually be less time. We were intrigued. So waving goodby to Tioga, we drove past Mono Lake and experienced the Sonora Pass, the 2nd highest highway pass in the Sierra Nevada,. The drive over Sonora was long and windy and very steep going east. Certainly kept my rally driving skills up to date. It would drop us in the central valley where along Highway 108 we could espy the nut and fruit trees, with what appears to be a lot of newly planted orchards. We headed onto Highway 580 and noticed the Altamont Pass Wind Farm Ahad been upgraded to newer windmills, now adjacent to the forever dead-looking 1st generation wind farm. Then we criss-crosse through Livermore proper and headed home along the picturesque backroads of Fremont and Union City onto the Dumbarton Bridge (which had a toll the took us by surprise) across the south bay onto the well worn Highway 101. Then Mountain View came into view. We arrived home. Our belongings we hope will arrive on the weekend. Many things have changed here in the bustling Silicon Valley, and yet, our townhouse smells and feels the same as we left it those many years ago.